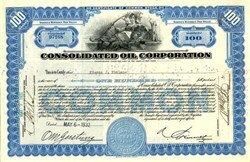 Beautiful certificate from the Consolidated Oil Corporation issued in 1932. 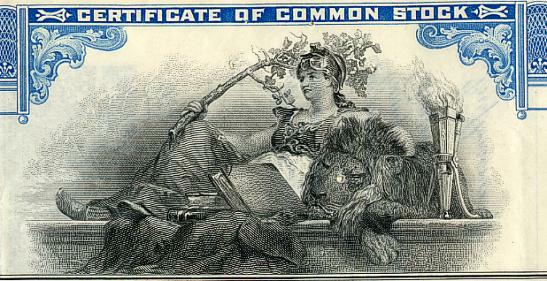 This historic document was printed by the American Banknote company and has an ornate border around it with a vignette of an allegorical woman leaning against a lion. This item has the signatures of the Company's President and Secretary and is over 75 years old. Consolidated Oil Corporation changed its name to Sinclair Oil Corporation in 1943. Sinclair Oil is an American petroleum company based in Salt Lake City, Utah. Founded in 1916 by Harry F. Sinclair, the company operates 2,600 gas stations in 22 states in the western U.S. and the Midwest. The company also operates three refineries, two in Wyoming, one in Casper and the other in Rawlins and one in Tulsa, Oklahoma. Other operations include 1,000 miles of pipeline. Its logo includes a large green dinosaur. The company has long history being a fixture on American roads and briefly in other countries with its green dinosaur logo. In 1969, Sinclair Oil Co. was acquired by the Atlantic Richfield Company (ARCO) but Federal government anti-trust provisions required the new entity to divest itself of certain of the Sinclair assets. The old Sinclair's east coast operations were sold to BP and a new, independent Sinclair Oil Company was formed by a holding company in 1976. The new company acquired the right to the Sinclair brand and logo and Arco's retail operations in the region between the Mississippi River and Rocky Mountains. Sinclair patented the gasoline additive SG-2000. The company also owns the "Little America Hotels & Resorts" group, which owns and operates Sun Valley, Idaho among other properties. During the decade of the 1920's, the Sinclair organization became involved in the Teapot Dome controversy. A contract to develop naval oil reserve lands in Wyoming was awarded in 1922 to Mammoth Oil Company, a structure organized by Mr. Sinclair to operate in Teapot Dome. Sinclair Consolidated Oil Corporation, as the holding company was known then, traded 250,000 of its common shares for a 25 percent interest in Mammoth, with an option on sufficient additional stock to assure ultimate control. In 1924, Sinclair Pipe Line Company (50 percent owned by Sinclair Consolidated Oil Corporation) extended its system 700 miles to Wyoming, at a cost of about $21 million. Under Mammoth's obligation to the government, oil terminal facilities were constructed at the Portsmouth, New Hampshire, Navy Yard costing $1,340,000. Alleging fraud in the award of the Teapot Dome contract, the government sued in 1924 to cancel the arrangement with Mammoth. The trial court held the lease legal and dismissed the complaint; but in 1927 the U.S. Supreme Court, on appeal, voided the contract on technical grounds, though finding "no direct evidence of fraud." A jury which deliberated only forty minutes acquitted Mr. Sinclair of a criminal charge of conspiracy to defraud. The use by Mr. Sinclair of private detectives to keep the jury under observation during the trial drew a sentence for contempt of court. During the long controversy, Mr. Sinclair gave 175,000 words of testimony before twelve legislative committees, disdaining the fifth amendment; but for refusing to answer one question which his counsel considered not to be pertinent to the legislative inquiry, Mr. Sinclair was held to be in contempt of the Senate. On the contempt citations, he spent six and one half months in the Washington, D.C. House of Detention in 1929. Both Mr. Sinclair and Mammoth Oil Company lost heavily in the Teapot Dome venture, the naval reserves being unprofitable. In 1928, Mr. Sinclair voluntarily returned to Sinclair Consolidated the 250,000 shares it had invested in Mammoth, plus $400,000 paid in dividends. During the entire seven years of the Teapot Dome-Mammoth Oil Company dispute, Mr. Sinclair continued as chairman and chief executive officer of Sinclair Consolidated, with the unanimous support of his directors, who tendered him a public vote of confidence as he left New York to serve his sentence.